NASHVILLE, Tenn. — For the third year in a row, NewSong’s blockbuster Winter Jam Tour Spectacular is partnering with Blue Scout Media to offer viewers around the world an unprecedented front row seat for one of music’s biggest tours. BlueScout’s StageHop.com will present a live webcast of the February 28 Winter Jam stop at Houston’s Toyota Center. Fans can register for the free event, which begins at 5 pm CT, by visiting jamtour.com/webcast. 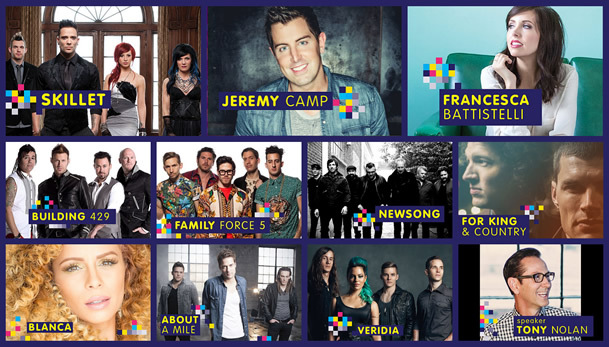 More than 30,000 people tuned-in for 2014’s live Winter Jam webcast, and this year viewers will be treated to more than three hours of music and ministry featuring headliners Skillet, along with Jeremy Camp, Francesca Battistelli, Building 429, NewSong, for KING & COUNTRY, Family Force 5, Blanca, About A Mile, VERIDIA and evangelist Tony Nolan. Sponsoring the webcast is Jesus Film Media, the digital expression of The JESUS Film Project, equipping everyone, everywhere for ministry. Winter Jam, which kicked-off January 2 in Charleston, West Virginia, and continues through March, has already seen multiple sellouts around the country to date. Promoted by Premier Productions and presented by Holt International, tour sponsors include Pure Flix’s Do You Believe? ; NBC’s “A.D. The Bible Continues”; University of Mobile; Teen Missions International; Pepsi; TheOverflow.com; Camp Electric; PREMIER Vacations & Events; Xtreme Conferences; Texas TransEastern; and Wayne E. Bailey Produce. Created and hosted by GRAMMY®-nominated NewSong, Winter Jam exploded from a single show in 1995 to one of the music industry’s biggest tours today. For four consecutive years, Winter Jam has ranked as Pollstar‘s #1 tour in the world for the first quarter, based on ticket sales. Blue Scout Media is a video production and streaming company providing an online experience that engages fans, builds an artist’s brand, and creates excitement among live music enthusiasts. Artists featured on StageHop include Martina McBride, TobyMac, Luke Bryan, Steven Curtis Chapman, Lecrae, and large music festivals including Winter Jam, Night of Joy, and MusicFest from Steamboat Springs, Colorado.